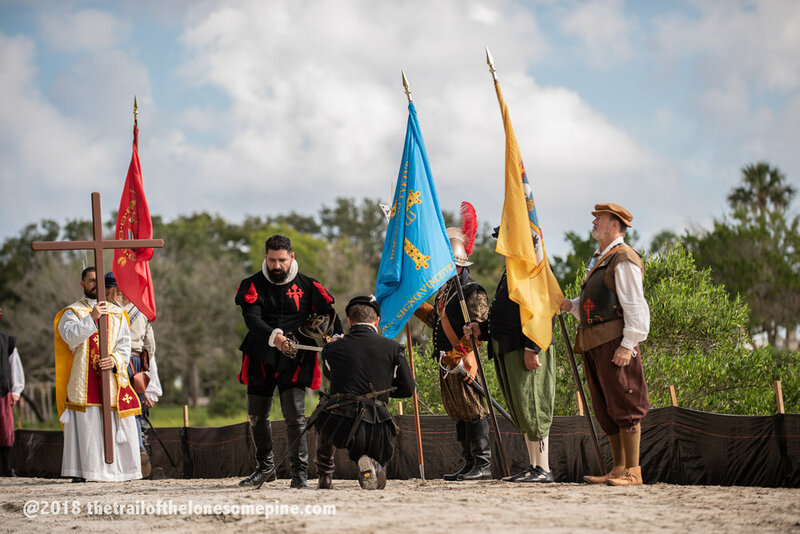 Founder’s Day celebrates the landing of spaniard Don Pedro Menendez de Aviles and the founding of St. Augustine on September 8, 1565. 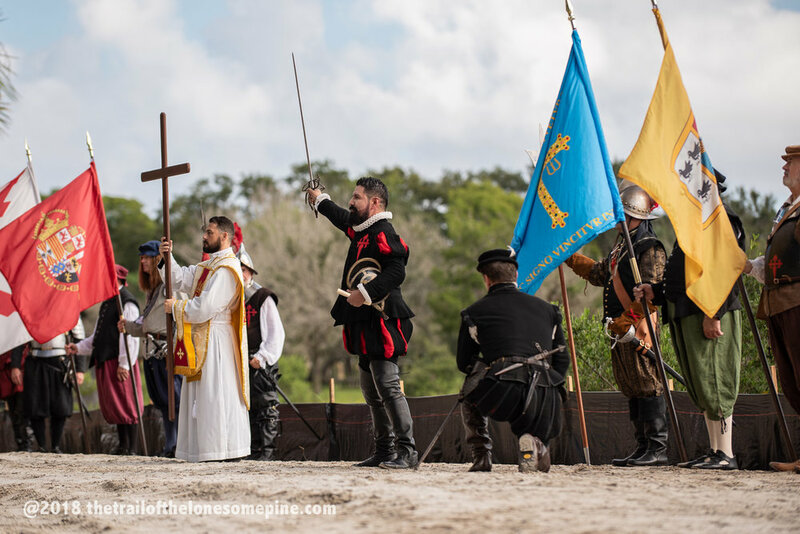 The reenactment by the Historic Florida Militia’s Men of Menendez takes place at the Mission Nombre de Dios (the actual place that the landing happened) the Saturday closest to the 8th of September every year. Menendez and his entourage approach and land at Mission grounds. Canon fire and musket salutes greet Menendez’s entourage from the adjoining Fountain of Youth Archeological Park. 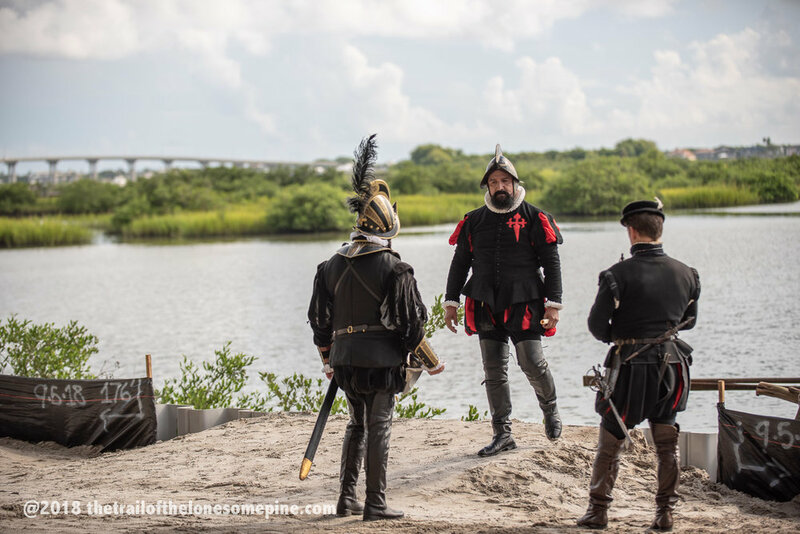 Mendendez and his men come ashore and are greeted by Father Lopez. Menendez proclaims the land in the name of God (Nombre de Dios). After the veneration of the Cross, the entourage proceed to celebrate Mass at a rustic alter made of wood. Followed by a Grand Processional from Mission grounds to the Fountain of Youth to reenact the First Thanksgiving. The reenactment did not take very long - about 45 minutes. We arrived 15 minutes before the event and got the very last parking spot. There are a LOT of people that come to Founder’s Day and stay for Mass. If you plan on going next year, arrive early to get a parking spot. Even though it is September, is is still very hot and humid in Florida. 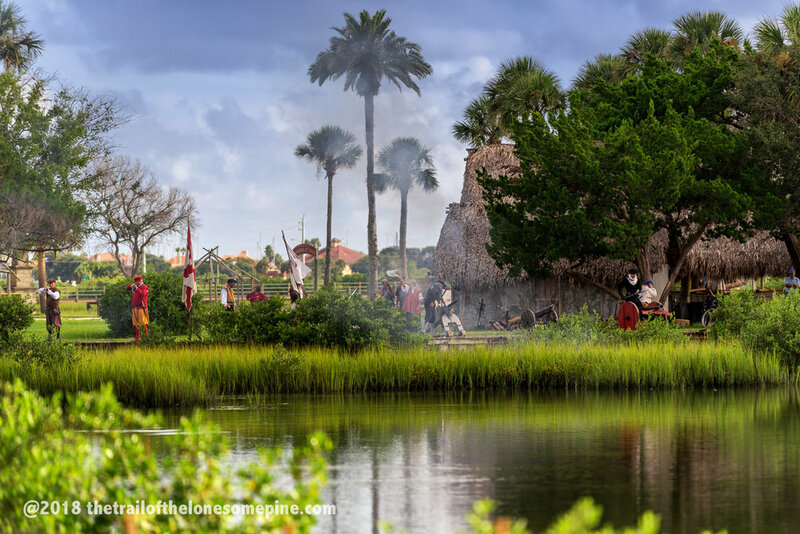 The grounds of Mission of Nombre de Dios are spectacular. Shrines and statues are surrounded by lush greenery and trees. It is here that the Great Cross was erected in 1965 to commemorate the 400th anniversary of the first parish Catholic Mass. The chapel, which is dedicated to Our Lady of La Leche, is a shrine which houses a detailed carved statue of Mary nursing the baby Jesus. The Great Cross was erected in 1965 to commemorate the 400th anniversary of the first parish Catholic Mass. Aidan and I really enjoyed the Mission Nombre De Dios Museum. We were very lucky to have a private tour of the many artifacts by docent, John. 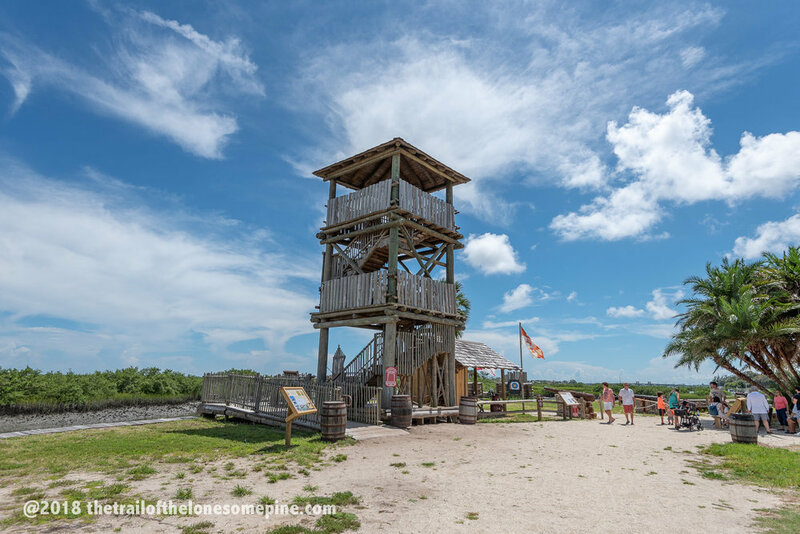 The museum focuses on the founding of St. Augustine. There is a wonderful diorama of the Mendendez Landing of 1565 and my favorite, the original casket in which Menendez was buried in 1574. Unfortunately, the events of the day did not stay with the posted schedule. While Mass was being held, Aidan and I did our museum tour. 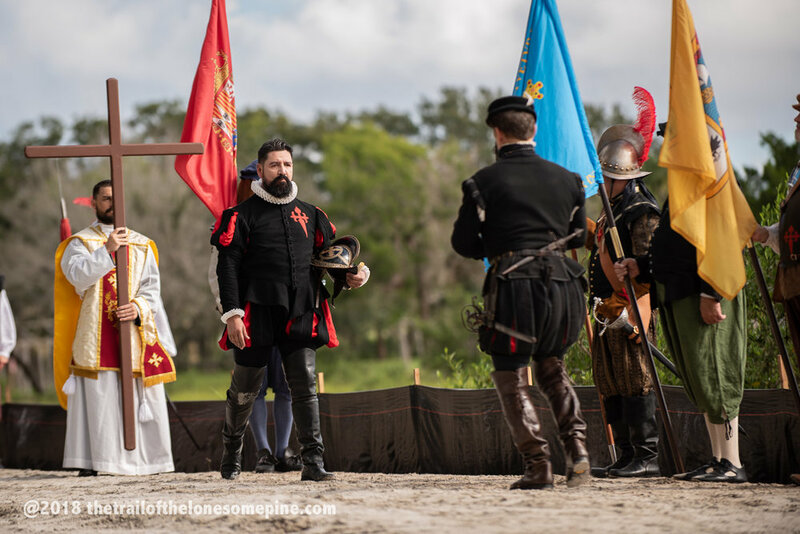 We thought we had plenty of time to head over to The Fountain of Youth Archeological Park for the reenactment of the processional to the grounds from the mission and the very First Thanksgiving. When we arrived at 12:50 for a supposed 1 pm. start - the reenactment had already been done. Apparently the schedule changed and they were much earlier. Even though we were disappointed, we did walk around the park and have a sip of water from the famous Fountain of Youth. I feel 10 years younger! 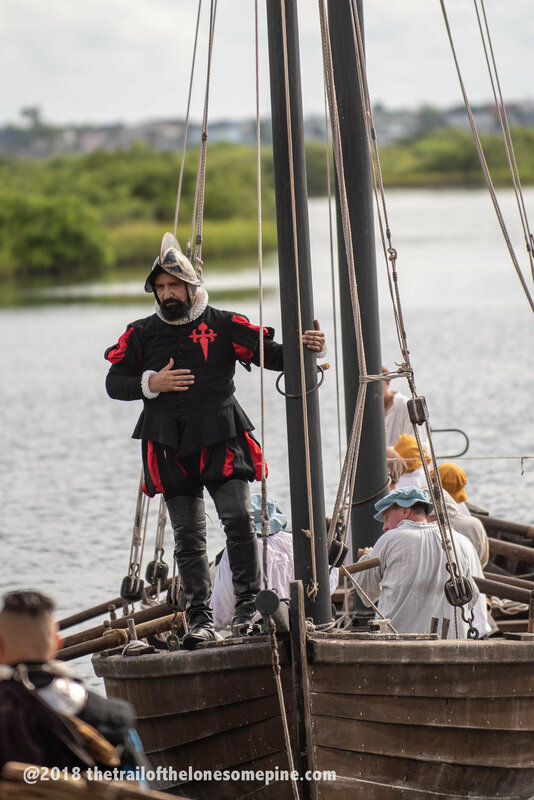 On September 8, 1565, more than 450 years ago, Admiral Don Pedro Menéndez de Avilés stepped ashore from Matanzas Bay on behalf of Spain and founded St. Augustine, Florida, the oldest continuously occupied European city in the continental United States. 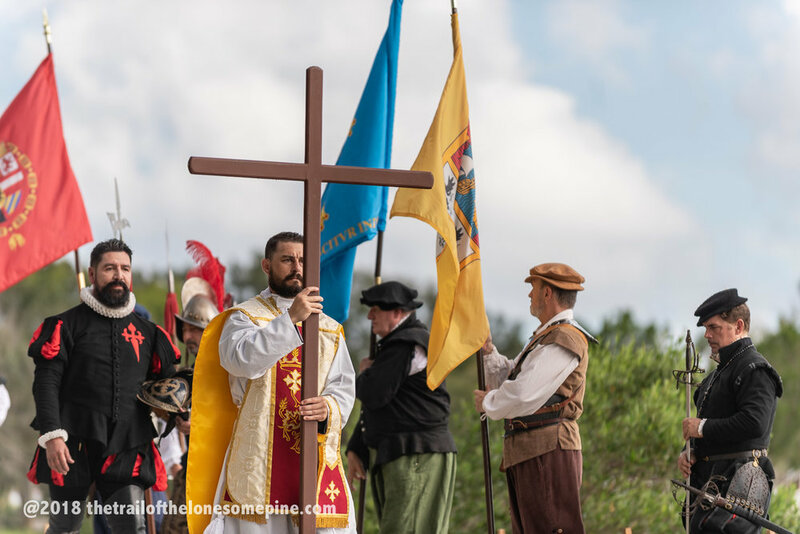 Each year, the city of St. Augustine marks this momentous occasion with Founder’s Day events, historical re-enactments, a mass, procession, meals and more. 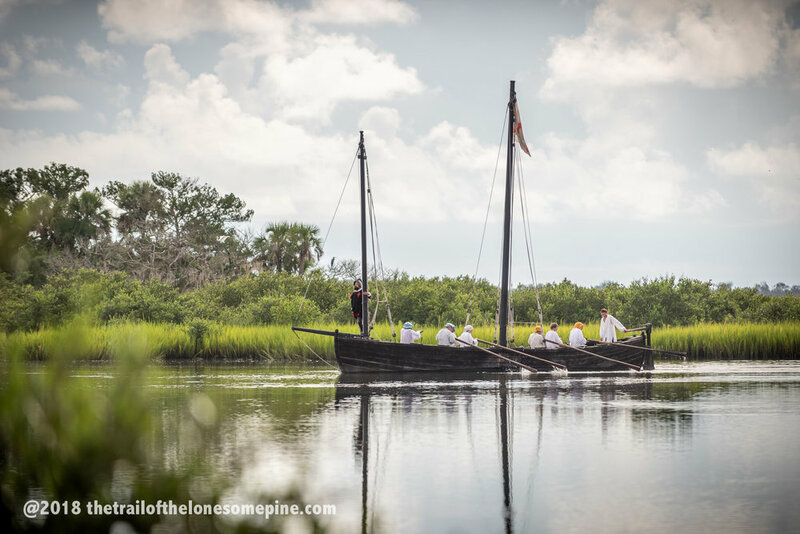 The landing party celebrated a Mass of Thanksgiving and, afterward, Menéndez laid out a meal to which he invited as guests the native Timucuan Indians who occupied the site. The Thanksgiving at St. Augustine was celebrated 56 years before the Puritan-Pilgrim Thanksgiving at Plymouth Plantation in Massachusetts, which makes this the first Thanksgiving in the continental U.S between Europeans and native peoples. Founder’s Day is celebrated in St. Augustine each year on the Saturday closest to Sept. 8. 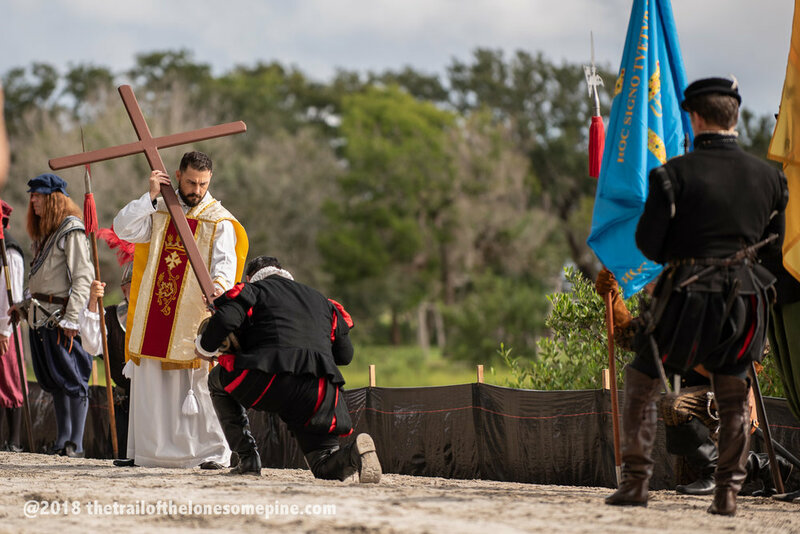 The celebration starts in the morning at the Mission Nombre de Dios with a re-enactment of the landing of Pedro Menendez and his crew and a Catholic Mass of thanks and celebration. 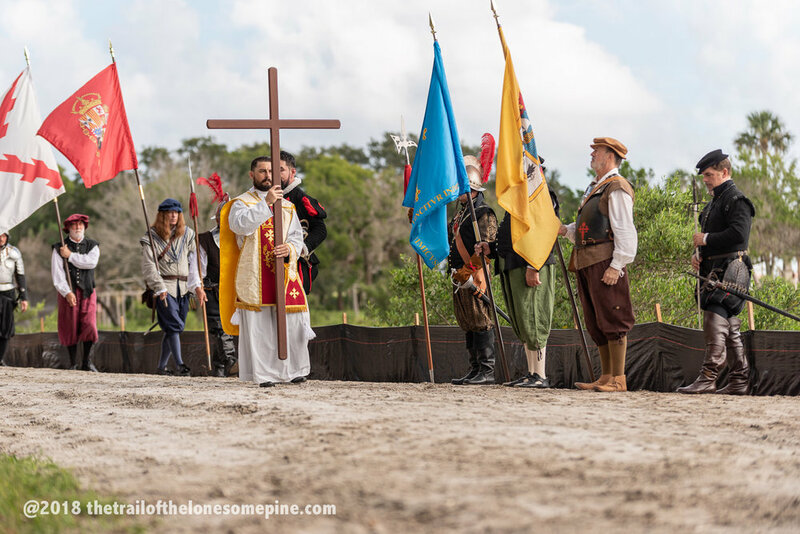 After the Mass, re-enactors travel from the Mission to the Fountain of Youth Archaeological Park, the original location of Menendez’ first settlement of St. Augustine.